The housing at Cardiff Pointe is, we believe, unique within the principality. The simple masterplan of street, square and landmark are supported by equally legible design principles of the houses forming the ‘background’ streets whilst apartment blocks form the nodal points of each corner. Here Neil MacOmish details the houses, in particular the balcony detail. The houses themselves are equally simple yet sophisticated in conception. The ones featured here are either three or four storey townhouses in terraces. The density requires garage space at ground floor and the principle living is at first floor level. This evokes a similarity with the quiet mews – you understand when you are in the semi-private domain and the spatial syntax from public to private space is also clear in its transition. The above also assumes a natural ‘classical’ section of base, piano nobile and attic storey – conceived in an entirely contemporary way. Therefore the expression of first floor living is a key component to the architectural character. The bay window to the study acts as a protective canopy to the front door. The kitchen acts as a hub or ‘hearth’ between living and dining spaces and at the same time, creates that front to back transparency of the typical Georgian terrace. The plot size is very economical – so the pocket garden is accessed from the utility room and is viewed from the day room, which can also be a gym or be converted into an accessible bedroom. So it was important that the living room had its own outside space. The ‘L’ shaped projecting balcony brings the outside in and allows oblique views of Cardiff Bay or the estuary, as well as overlooking the pocket garden and the landscaped parking court (there to service the adjacent apartments) – the upstand of the L directs the view and creates a privacy screen from your neighbour. This upstand also affords some protection from the wind on an exposed promontory. The houses are constructed in a closed panel timber system and therefore to express this, the brickwork is stack bonded to articulate that it is not structural or carrying a load. 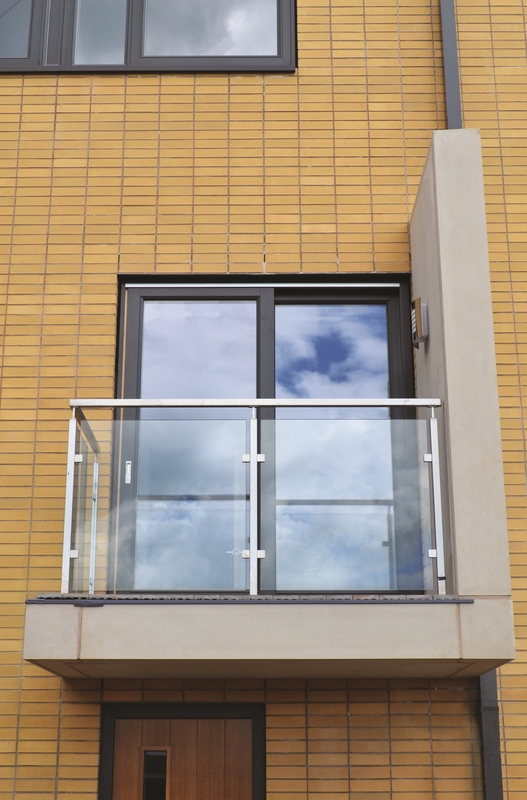 The cantilever of the balcony had to be carefully detailed to coordinate with the European brick module of 240 x 65mm and all the normal avoidance of cold bridging, as well as appearing seamless from inside to out. The crisp form of the balcony is achieved by using Glass Reinforced Concrete (GRC) on a steel sub-frame – and the simple repetition of this feature accentuates the ordered rhythm of the houses within the overall composition of the terrace. The handrails and uprights of the glass balustrade were selected in square rather than circular section as these were consistent with the overall geometric language.